Ugh! 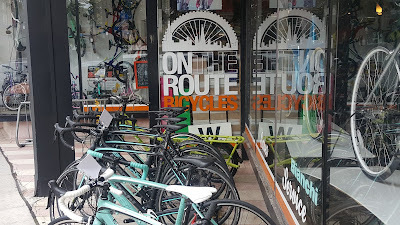 I am no stranger at On The Route Bicycles with my various mystery flats and equipment needs for a big family. I visited recently after tearing yet another tire valve (have since bought a better hand pump and an adapter for my Presta valve). The Lincoln Square location is a few blocks from my house and a couple blocks from the CTA Western Brown Line stop for those further out. The staff is great in evaluating user issues and offering solutions. The owner has also contributed to local fundraisers. The store is everything you could ask for in a local business part of a charming neighborhood downtown. Thanks again for keeping my 1998 Trek 7000 on the route!